From nearly the moment they met, she knew Isaac was the one for her. And even though they were young, and even though there was a long drive separating them, it was obvious to everyone who saw them together that they were made for each other. So, nearly two years later, it was no surprise that Ellie was ready for Isaac to propose. Since they were still long distance, there were only a handful of opportunities when it might happen, and Ellie was positive that she would see it coming. She didn't know that Isaac had already talked to her father, and that he had better plans for their weekend than she could have imagined. 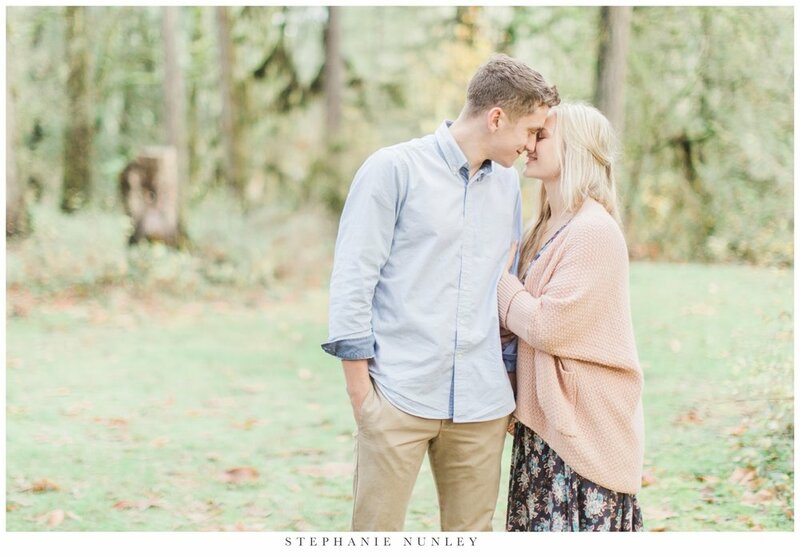 With the help of Ellie's family, Isaac planned a beautiful day for the two of them that led them to a park they had spent a lot of time at together, and it was there that Isaac asked Ellie to be his wife. I met Ellie a few years ago, not long after she and Isaac had begun dating. The next time I saw Ellie was about a year ago, and we were able to sit and talk for a few minutes as she told me a bit about how their relationship had changed and grown over the past year. And when Ellie got engaged and thought of me to photograph her wedding, I couldn't have been more excited! Lucas and I flew to Portland this past weekend to spend a few days with these two and their families, and their wedding weekend was absolutely incredible. Whenever I photograph destination weddings, I like to schedule an hour or so for a little mini engagement session the day before the wedding, so we can all get to know each other a little better before the wedding day. Ellie, Isaac, and I spent part of Friday afternoon together at Lewisville Park in Battleground Washington, the same park where Isaac proposed to Ellie just a few months earlier. I love that the location is so sentimental for them, and I hope you enjoy just a few of my favorites from our time together!